Experiencing shoulder pain while running may not be something you expect. After all, it is the lower body that exerts effort when you run. Still, shoulder pains are common among runners. We will discuss the most common causes of shoulder pain and what steps you can take to prevent the condition from escalating. Also, we will explain the importance of proper running form and how it can help prevent shoulder problems. If you suffer from this, poor running posture can put extra stress on your shoulders as you swing your arms when running. If you have a misaligned upper back and are unaware of it, in time, it may cause inflammation and impinge nerves. This condition can make your shoulder pain worse. Failure to maintain proper posture and alignment when you run is also the cause of many ankle injuries. If you end up landing in an unbalanced way with your sole twisted inward or outward instead of flat on the ground, only two of your ankle ligaments may carry your entire body weight. Direct shoulder injuries can include sprains, strains, and bruises. These are called acute injuries and can be caused by falling on your outstretched arm, twisting of the shoulder or a sudden blow to the shoulder. Your shoulder can become numb, painful, weak and running in this condition only makes matters worse. ​Referred pain is pain that indicates a more serious problem that has nothing to do with your shoulder or back. If there is a different cause of your shoulder pain such as potential heart problems, the stress that the cardiovascular system experiences during running may make natural movements seem painful. It is best to consult a physician if you expect that your shoulder pain is caused by a different problem. If this is the case, follow the doctor’s advice before trying any of the following tips. ​Although shoulder pain may be an indication of a more serious disease, this is not commonly the case. If your shoulder pain is caused by injury or overuse, there are some practical steps you can take to prevent future problems. Tilt your head so that you gaze ahead naturally. Remember that it is your head that guides the rest of your body. Make sure your chin stays relaxed and you keep your gaze straight ahead. Keep your torso and back naturally straight as you run. Keeping an upright position promotes optimal lung capacity. Avoid slouching and try and feel yourself naturally straighten up. Even when stepping forward, avoid bending your torso ahead but keep it straight. ​The alignment of your hips is another important factor in improving running posture. Once you have your torso in a proper position, your hips will naturally fall into proper alignment. Avoid leaning forward which puts pressure on your lower back. Keeping your stride in proper position will also help you conserve energy. The proper stride length should allow you to land your feet directly beneath your body. Avoid extending your leg in front of your body which can cause injury due to the pressure it places on your lower legs. ​The way your foot strike﻿﻿﻿﻿s the ground is also an important factor in achieving proper running form. Ideally, you should land in your mid-foot and then quickly roll forward. You should spend at least time as possible on the ground and instead spring silently off after each step. Running with proper form does more than prevent shoulder pain and can also help prevent your ligaments from stretching. Running in improper form can trigger unnecessary pressure on the ligaments between the diaphragm and the stomach which move up and down as you run. Constant tugging on these ligaments can trigger what are called side stitches which is a sharp pain on your side. The arm swing is one of the most critical aspects in stabilizing the body when you run. Achieving proper arm swing can help prevent shoulder pain due to injury or overuse. Getting the right arm swing can not only help avoid shoulder pain but can make you use less energy and move faster. Simply running five times a week is not enough to build upper body strength. Strengthening your core and upper body can help you develop better running posture while increasing ﻿﻿muscle power and flexibility. These factors combined can greatly improve your overall performance as a runner. On your non-training days, incorporate upper body workouts such as planks, pushups and army crawls. For example, pushups promote better shoulder range of motion, better position, and overall better posture. There are also different variations of plank workouts that can be tailored for runners. ​The stronger your upper body is, the less likely the chance of developing shoulder pain. Also, having a stronger core will benefit your posture and overall running performance. Experiencing shoulder pain while you run is normally less serious than lower body injuries. It is likely caused by posture and alignment problems, injuries, inferred pain or disc disease. Once you are able to determine the cause of your shoulder pain, follow the suggested steps to improve your running form, get the right arm swing and build up upper body strength. 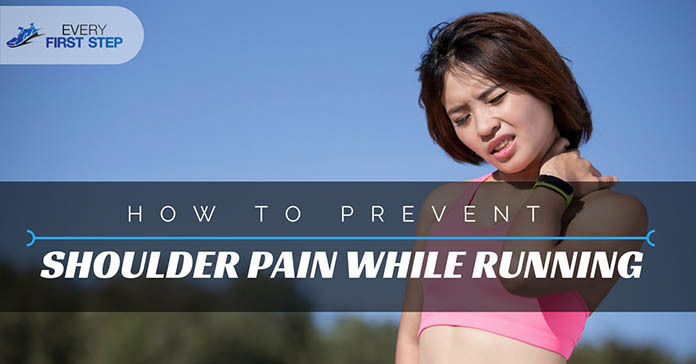 There is no need to ever again suffer from shoulder pain from running, follow the tips we provided and enjoy your next run! How did you like our article? We would love to hear your thoughts in the comments below. Have you experienced shoulder pain when running? What did you do about it? Let us know your stories below. Also feel free to share this information with other running enthusiasts or family and friends.